Ready for the Offseason? Are your Boards? For a lot of us water men and women, the offseason is near. As it gets colder we'll have fewer opportunities to ride our paddleboards, surfboards, and wakeboards. Bumor. How much did your surfboards cost? Don't make the mistake of mistreating them this offseason - they're too valuable. Give them a proper surfboard storage rack. At StoreYourBoard, we've got you covered for all your board storage rack needs for any quiver - so after this offseason, your boards will be in the same great shape when you're ready to ride them. 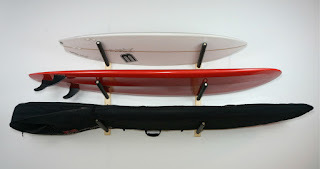 Multi-Surfboard Wall Rack: is an incredibly strong surfboard rack. It's built from steel so it will stand up to the wear and tear for years to come. It's also super versatile - it can hold up to 4 longboards or shortboards, and you decide how far apart to mount the support racks to accommodate the surfboards in your quiver. Also the 4 sets of rack arms included can be locked into the rack at any location along the vertical supports, your choice. 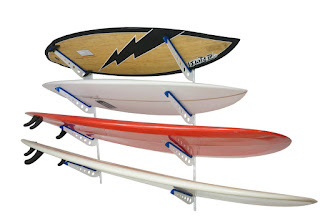 Steel Surfboard Triple Rack: here's your extra strong, durable triple storage rack. Each of 3 levels fit most all surfboards and with the spacing lets you keep your fins in, perfect for everyday use, perfect for your garage or shed. Whether it's longboards, thrusters, fish - whatever - this rack should be able to hold it, depending on how far apart you mount the arms. The arms are removable too, so save space when you're not storing your boards. 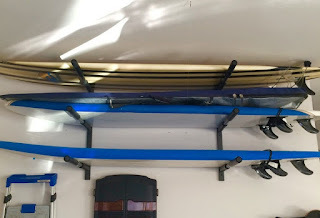 Wood Surfboard Storage Rack: here's a great surf rack that you just might like best because it's made of wood and is a no-frills, all business storage rack. It's got 3 rack levels to store your surfboards fins in, and has padded foam covering the rack arms, so your surfboards don't pick up any scratches or dings while you're storing them. Mounting hardware of course is included.